For those serrated edge lovers! Ideal for cutting rope and holds an edge longer than the straight edge. Responding to the need for a lockblade that is durable, yet light in weight (42 grams, 1.4 oz.) the Z390SW features a durable black Zytel handle and serrated edged blade, great for cutting and maintaining an edge. 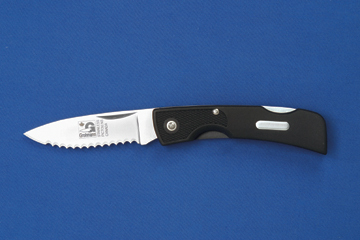 Zytel handle, high carbon stainless fully serrated steel blade. Available only in high-carbon stainless steel.